Addressing the uric acid that is intended in this discussion is a way to overcome uric acid which exceed the threshold recommended by medical personnel to drop back to normal. Normal levels of uric acid for women ranges from 2.4 to 6.0 while for men between 3.0 and 7.0. Before we look for ways to overcome gout, it is important for us to know at once detect the cause of why we uric acid to rise. Without we learned about the causes of the increase of uric acid, then certainly we will have difficulty in detecting the cause of why we uric acid to rise. 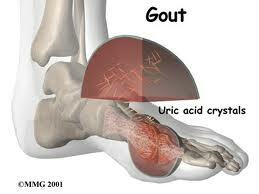 Ok, to determine the causes of gout please read here . After you read and know the cause of gout, it is time for us now to discuss how to overcome gout. As we know that based on factors penyebanya, gout is divided into two kinds, namely primary gout and gout secondary. Diseases caused by uric acid or a derivative genetic factors are very difficult to handle than the genetiknay. In fact almost certainly will not be able to change a person's genetic potential available to him because he is derivative. Or say weve had from there his way. But do not worry, God willing, the genetic potential will have no effect if the factors stimulating the emergence of another gout can be controlled. People who already have a genetic potential for developing gout, God willing, will be freed from gout if he can control other causes. Well, addressing other causes is what will be discussed at length in this blog. Please you continue reading the discussions below carefully. Previously, you have to know first what it hormones?. He is a chemical messenger between cells or groups of cells. Hormones circulate following the circulation of blood and fluid cel cel to find the target. After finding the target cells, the hormone will bind to specific receptor proteins on the cell surface and transmit signals. Receptor proteins receive signals and react either by affecting the genetic expression of cells or altering the activity of cellular proteins, among them is the stimulation or inhibition of growth and apoptosis (programmed cell death), activation or deactivation of the immune system, regulation of metabolism and preparation of new activities ( mating, caring for a baby), or phase of life (eg, puberty and menopause). In many cases, one hormone may regulate the production and release of other hormones. Hormones also regulate the reproductive cycle in almost all multicellular organisms. Hormonal imbalance will affect the work system in the body. Work systems cel, cel tissue, organs and glands in the body system is not running as it should. Even hormonal imbalance will affect the formation of purines in the body either be increased or decreased more than necessary so the body deficiency of purine. In the event of the purine pembentukankan far melibihi the body needs, the body will be very potential for developing gout. Under normal conditions, the kidneys will remove the remnants of metabolism in urine or urine. However, if there are problems in the kidneys kidney alias in conditions not fit or ill, it will automatically interrupt the disposal of the remains of metabolic outcomes such as uric acid and others. Uric acid is not wasted malalu urine will continue to settle in the veins, which in turn accumulate in the tissues and joints. In the end there was acid disease gout. However, it should be recognized that an excess of uric acid exceeds normal kidney's ability to dispose of it would also lead to kidney disease. Too high uric acid in the blood and the kidneys are unable mengeluarkannnya - but his kidneys are healthy-long run will also accumulate in the kidneys that would cause a gijal become ill. Even excess uric acid will trigger kidney stones. Consumption of foods that contain high purine. Consuming foods high in purines is the main cause gout. The amount of purines that goes into our body will produce a lot of purine metabolism is uric acid in the blood. Uric acid levels in the blood will certainly complicate or aggravate the kidneys to excrete uric acid is even lead to kidney ketidakmampuang to remove all of the products of metabolism. At the end of uric acid accumulate in various organs such as the joints, liver, blood, and will even settle in the kidneys. Piles of uric acid that is not immediately addressed will result in complications. Alcoholic drinks are very dangerous for kesehatana general. He can damage the brain and nerve tissues other nerves. This is one lesson beralkohal why drinks are forbidden in Islam. Alcohol more negative effects than benefits. We suggest you either still healthy even more the already sick to leave beralkohok drinks altogether. If not, your old age will terncam susceptible to disease. Set a good example to your children and grandchildren. Alcohol and drugs are toxins in the body. The more you consume alcohol and drugs, the potential menumpuknnya toxins in the body increases. The buildup of toxins in the body is one of our body's main Sebat disease including gout. Besides, alcohol is also mengandun purines. 4. do detoxification or removal of toxins. 5. Perform natural healing. This is what we recommend.